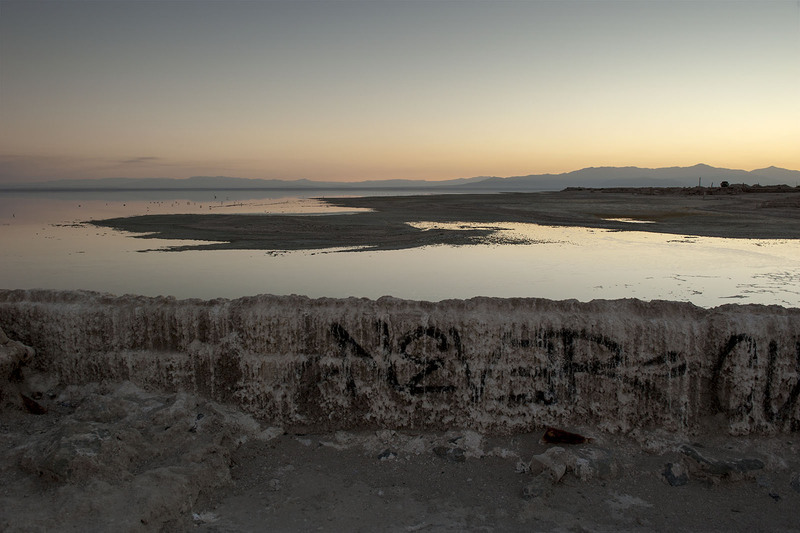 Seeing how no one's posted here in awhile, I will take a shot ..
At Bombay Beach, at the eastern shore of the Salton Sea. Personal preference thing GB but I'd like the reds in the sky enhanced a bit more, other wise very nice image. Looks pretty desolate - you've captured the essence of the area well! Thks fellows. No idea what the rest of the wall says, as there's so much graffiti around that area that I stopped paying attention. The sunsets are often incredible here, but not in the classical sense. The salt coming off the water creates a dreamy haze that I've yet to experience anywhere else. This evening was a little subtler still, but Ok. If anyone's still checking this site, I will continue to post. I just don't get the same feedback anywhere else (I am also on fotozones.com, which isn't too bad, I guess). I have two emotions to this photo, serenity and desolation which is really good. However, a little more saturation in the sky would nail it for me. this is a wonderful photo. what camera did you do that? I like your captured composition!